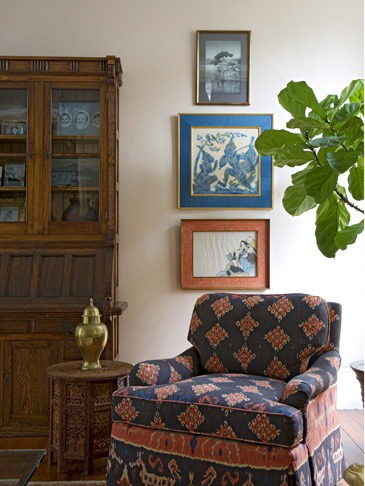 In the States, ikat may now be just as familiar a term as toile or crewelwork. Maybe even more familiar. For a while, Western designers have been channeling the textiles of Southeast Asia (think Indonesian sarongs and Thai wovens), with one of the most recent examples being John Robshaw's Siam collection. Another favorite of decorators is China Seas' linen/cotton Ikat II in Sienna Negre Tint. This fall, curators at UCLA's Fowler Museum -- home to what is reportedly one of the world’s most significant collections of Timorese textiles -- will help spread the word about the varieties of weavings specifically made by Timor's women. Although considered to be spectacular, these cloths are often less recognizable on this side of the globe. Opening September 7 and continuing through January 4, 2015 is Textiles of Timor, Island in the Woven Sea, an exhibition of fifty brilliantly colored cloths from both West Timor (today part of Indonesia) and Timor-Leste (aka East Timor). A companion book will be available, too. BTW: Programming related to this show will be a highlight of the Textile Society of America's 2014 Biennial Symposium in L.A., September 10 through September 14. Details here. LACMA also plans to have a strong presence during the event. In the meantime, one last Thai-inspired print by Robshaw.